Come and see Coupiac castle in its rural setting ! You’ll find fascinating medieval architecture but also a lot of activities. 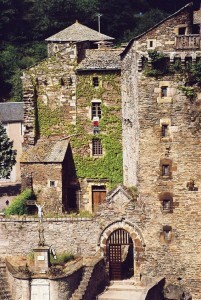 In the heart of the Languedoc-Roussillon-Midi-Pyrénées region, within the Grands Causses Natural Regional Park, near the Tarn valley, in the south of the Aveyron département, the village of Coupiac is dominated by its medieval castle, a former possession of the Counts of Rodez and Toulouse. Visit its numerous furnished rooms to discover its history and well-preserved Gothic architecture. Guided by illustrated information panels and permanent exhibitions, you will learn about daily life in the middle ages in a historical monument dating from the 15th century. For families, medieval costumes and a treasure hunt allow children to have fun while exploring the fortress: at the end of the visit they will become a knight or princess of the castle. Guided visits for groups of adults, school pupils and holiday centres are available throughout the year with prior booking and may be accompanied by workshops on medieval themes, not forgetting our souvenir shop specialising in the medieval period. Groups of walkers will appreciate our programme specially adapted for them, combining way-marked paths, a picnic and a guided visit of the castle. On this site you will find all the information necessary to organise your visit here: opening hours, map, local services…please don’t hesitate to contact us if you require any further information. -> More about the history of the castle and the association that runs it “Los Amics del Castel de Copiac” (“Friends of Coupiac Castle” in the local Occitan language).